We had a family get together about a week and a half ago for my Mom’s 81st Birthday. I love to try out new things at these gatherings but I don’t leave out the tried and true. I made a sluttier version of the Slutty Brownies everyone has seen on the internet. I topped them with whipped ganache and they were a hit with the family. The co-workers loved them too when the hubby and I took them to work. I made Macarongigli and Double Stuff Oreo Ice Cream Cake too. Everyone definitely loved those, along with all the other stuff my hubby barbecued. These brownies are so rich and chocolaty. I dare you to eat more than one. Just look at those layers! Step 1: For the cookie dough: Pre-heat oven to 350 degrees. Line an 8” by 8” baking pan with aluminum foil and spray with cooking spray. Step 2: Cream together the butter and sugars with a mixer. Beat in the eggs and vanilla until entirely incorporated. Add the remaining dry ingredients except chips and mix on low until incorporated. Fold in the chocolate chips. Step 3: Press 3/4 of the cookie dough evenly across the bottom of the pan but taper to a thinner amount as you get closer to the sides of the pan. You can bake a few cookies with the remainder of the dough (about 8 – 10 minutes at 350 degrees) or just munch on it like I do. I don’t care about the raw eggs. Add a layer of Double Stuff Oreo cookies, four across by four rows, set them centered between the cuts about where you’ll slice the brownies after baking. Step 5: For the brownie batter: Prepare the brownie mix as described on the package. 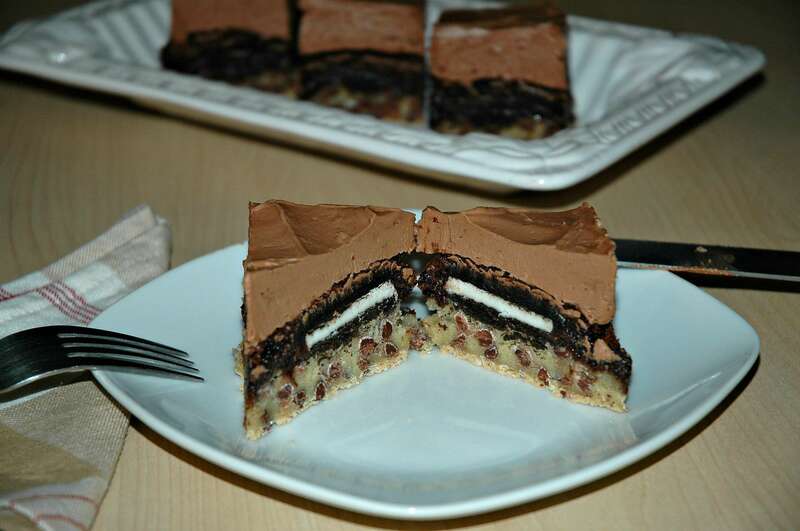 Top the cookie dough and Oreos evenly with brownie mixture. Step 6: Bake for 40 to 50 minutes on the top rack of the oven. I baked for 50 minutes. Let cool at least 10 minutes before attempting to remove the brownies from the pan. Let cool completely. Step 7: For the whipped ganache: Melt the chocolate chips with all the other ingredients in a medium microwave safe bowl. Begin by heating the ingredients for 30 seconds in the microwave. Stir the ingredients. If the chocolate hasn’t melted, microwave in additional 10 second intervals while stirring in between each one until the chocolate has melted. Don’t overheat the chocolate. Alternatively, you could use a double boiler to melt the chocolate. Stir the mixture until it’s completely combined and smooth. Set aside to cool. Step 6: While the ganache cools, place a mixing bowl in the freezer. When the ganache has completely cooled, transfer the mixture to the chilled bowl and beat on high using an electric mixer. I used my portable mixer. The mixture will become much lighter in color and when you see soft peaks, stop mixing. This frosting is delicious but don’t eat it all with a spoon. Step 7: Spread the whipped ganache evenly across the top of the completely chilled brownies. Refrigerate at least an hour. Cut into sixteen pieces. Serve chilled or room temperature. Tips: Store in a sealed container in the refrigerator. Brownie recipe adapted from What’s Gaby Cooking (originally from the Londoner). Whipped Ganache recipe adapted from Simply Gloria, Dark Chocolate Cake with Whipped Ganache Frosting. 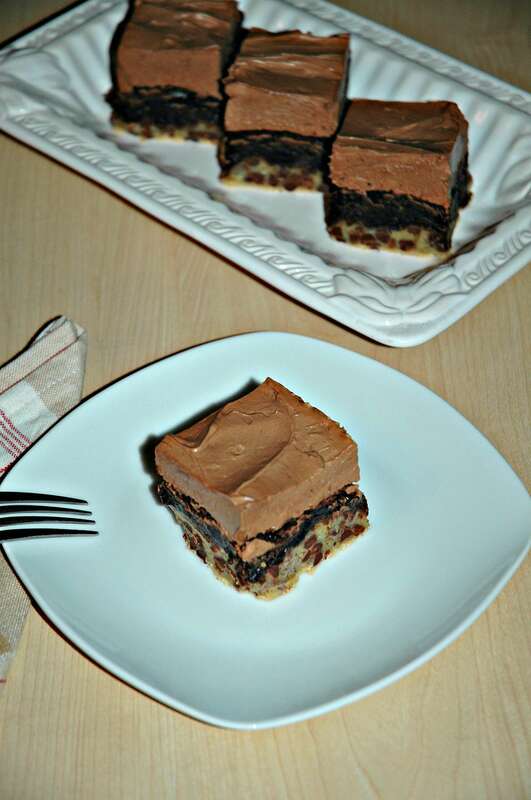 This entry was posted in Cookie, Dessert and tagged brownie, butter, dessert, ganache, Oreo by Annamaria @ Bakewell Junction. Bookmark the permalink. These are so going to be made! 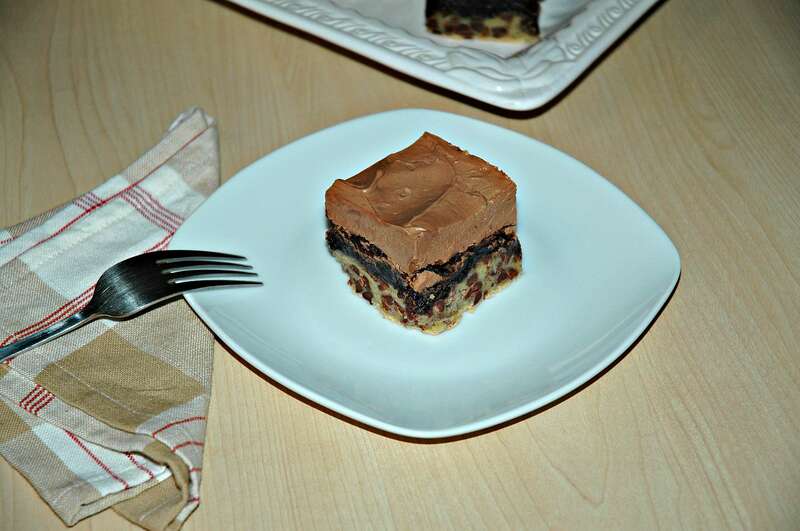 I love slutty brownies, but now that I can make them sluttier is even better! I love the addition of ganache or frosting to anything! I would love for you to stop by tonight’s Throw Back Thursday link party! Oh my goodness these look good! Maybe I live under a rock but I’ve never heard of slutty brownies… it’s probably just because the universe was keeping me sheltered until the sluttier slutty brownie could be invented! Thanks for linking up at the Welcome Home Wednesday link party… we can’t wait to see you next week! You know that I love something when I tweet it, bookmark and print it. Guess what I am making tomorrow? Thanks so much for sharing. You’ll enjoy these as much as we did. Oh, goodness! This sounds heavenly. Thanks for sharing at the Weekend Blog Hop (myflagstaffhome.com). These look fabulous! I have done the regular version of these, but this one sounds amazing! I want to try these ASAP! I have been living under a rock, because I haven’t heard of slutty brownies, so I must try both versions: slutty and sluttier! I’m a sucker for sweets, so this will be in my oven soon. Thanks for linking up on the #FridayFunday Hop! These look amazing, Annamaria! What a cute name as well. And Happy 81st Birthday to your Mom! Thank you for being a part of the Hearth and Soul hop. A chocolate lovers dream for sure! Thanks for sharing the recipe with SYC. They definitely look good!! Thanks for Linking up at My 2 Favorite Things on Thursday!! Hope to see you again this week!! Pinned! I’m going to have to make these, if only for the name! They sound delicious! Your Brownies look wonderful! Hope you are having a great day and thanks so much for sharing with Full Plate Thursday. Happy belated Birthday to your mom!!! These look so yummy…and a little naughty. Thank you for sharing your recipe with us on Welcome Home Wednesday. We hope to see more of your yummy posts next week. Ha! I love the name of these! And they look tasty! YUM!! Thank you so much for linking up at Tasty Tuesday! This post has been pinned on the Tasty Tuesday Pinterest board! I love having you and can’t wait to see you next week! These look absolutely sinful! Yet delicious! I love brownies! (who doesn’t?!) Thank you for Linking up with us at the Tips and Tricks Link Party! Also, please link up your newest posts – you might be featured again next month!